Ultra-rich black ground coffee with extracts of Chaga, Gotu Kola, Bacopa, and organic Ganoderma. 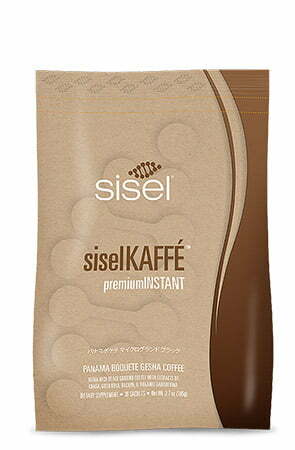 Contains 30 Sachets of Instant Premium Panama Boquete Gesha Black Coffee. Our premium coffee beans are grown in a unique micro-climate on the slopes of an ancient Panamanian volcano. Instant Premium Panama Boquete Gesha Black Coffee. This enriching atmosphere produces sweet coffee beans, unique to the world. When combined with a rich blend of Chaga, Gotu Kola, Bacopa and organic Ganoderma extracts creates what Sisel believes is the healthiest and best-tasting coffee available. Kaffé MicroGround Premium Black™ is a truly unique coffee offering. It features the taste of the Panama Boquete Gesha coffee bean. This bean is a recognized grade A.
Sisel then roasts it to perfection in infrared roasters, resulting in a coffee that is rich in taste and satisfying in consumption. With our MicroGround Premium Black coffee, you can truly experience the simple delight of a perfectly produced cup of coffee. We know how important a great cup of coffee is to the serious drinker. The Panamanian Gesha bean was Sisel first choice.